Service door weatherstripping is typically used to seal the perimeter and frame around duct service doors in heating and air systems. Service door weatherseal tape is easy to peel and stick for a quick, convenient application. Remove weatherstripping from the liner and apply pressure to affix the tape. Weatherseal should be allowed to set before opening and closing the seal. Service door weatherstripping tape is supplied slit to width in rolls or continuous run spools. Pre-cut frames can also be provided to fit specific dimensions. 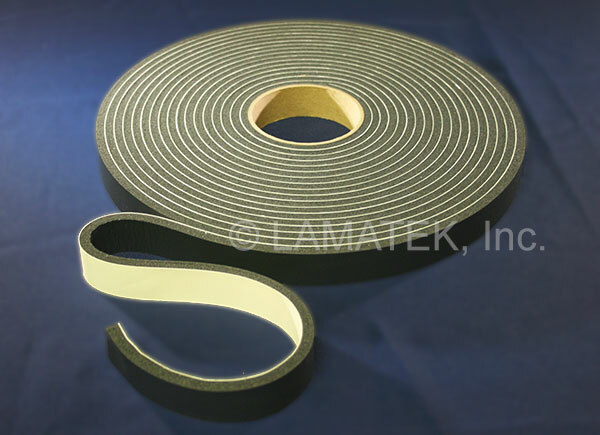 LAMATEK can supply a variety of materials based on the temperature range of your application. PVC, Neoprene and Vinyl Nitrile are excellent weatherstripping solutions that remain flexible under varying temperatures. Service door weatherstripping is laminated with an aggressive rubber based adhesive on one side. LAMATEK’s service door weatherstripping is flame retardant and temperature resistant. Let our expert team help you choose the best solution for your service doors. Contact us for technical information, samples and to request a quote.